Fishing in Huatulco Mexico with the best captains and boats , Huatulco Oaxaca is well know as one of the best palces to fish for sailfish, stripped, black and blue Marlin, Dorado, Yellow fin tuna, snooks, amberjack, roosterfish, sierra mackerel, jacks, etc. Huatulco is situated on the edge of the Gulf of Tehuantepec, and is one of the best kept secrets in game fishing on the Pacific Coast of Mexico, Huatulco is nicely positioned to receive a warm northerly flowing current and this brings marlin, sailfish, yellowfin tuna, dorado and other game fish species. 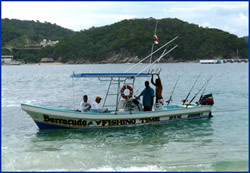 Several proven charter fishing hot spots are within short runs of the Huatulco Marina of Santa Cruz. Omega Sport fishing Charter is a 35 feet boat with twin diesel motor and has a capacity up to 8 people The Omega Boat is very comfortable and has 6 fishing lines fishing chair and experienced Captain and first man ,that can take you out for deep sea or small game fishing. Pocamaxtil Fishing Charter , is another nice boat to go fishing on, is very comfortable This fishing charter has 6 fishing lines and can take you either deep sea or small game fishing, also can be chartered to take people to snorkel and fishing. This is a 25 feet boat , specializing in sportfishing, has 4 fishing lines and is very fast has a outside motor a 75 yamaha and has a capacitu up to 4 people and give you 6 hours of fishing also can take you small game fishing and snorkeling at one of the best palces from the area. This is the biggest yacht from the fleet Virginia Sportfishing Charters is mostly for cruising along the bays of Huatulco and to take people to snorkel at the best snorleling areas of Huatulco , can also be rented for game fishing . Virginia Fishing Charter can be rented for hour Min 4 hours. Barracuda Boat is a 26 fet sportfishing panga , on this boat we can take you deep sea or small game fishing as well snorkeling , life jackets on board and expert captain.